In 2008, I moved to Les Cayes, Haiti to live out my dream of changing the health status of the poorest country this side of the planet, by practicing "political medicine." This blog begins by telling my story of when I first moved to Haiti until now, as a second year medical student. I partner with non-profits to train rural Haitian youth to become community health workers in their villages, empowering a people to take control over their own health and save their own lives. Our new public health team in training! 24 Community Leaders. Ages 21-42. 12 Villages. 12 Schools. These last four months regarding the public health program were busiest for the community health nurses who were further editing the manual and putting together power-point presentations and skits for the public health lessons and also for Patrick, the programs director and Sarah, the new country director in training at Hope for Haiti. The two of them, did the logistical planning for the PH program including the selection of the public health students from each school. They helped in the editing process, put together skits and put together a 2-day program along with the nurses that flowed flawlessly. It was wonderful to see that what started with a simple lesson on bed bugs living at the Espwa orphanage has grown to be a model education and training program being used to train leaders from 12 schools and villages around southern Haiti. We are now training community health workers ranging in ages 21-42, bringing health education lessons to thousands of children who would otherwise not receive the life-saving training. The importance of these programs is seen most dramatically in our recent cholera outbreak that has now spread to all regions of Haiti and claimed the lives of over 1,600. Nearly 20,000 are thought to be infected. The incidence of cases is thought to have skyrocketed in the last few days because of the large groups of people who were congregated together all over the country for this weekend's presidential elections. It is believed that the prevalence of the disease will be 200,000 by the time we are able to put a stop to the spread, treating those who are infected. This will prove most difficult in the rural villages of Haiti that are not easily accessible by medical personnel and where clinics are not easily accessible by the people. This highlights the importance of our training programs on the ground now. This past Thursday and Friday we began the 1-year training program with our 24 newly selected leaders from 12 rural communities who have been nominated by the school directors in their villages as ideal candidates to become community health workers (CHWs). The 2-day lesson which included 16 hours of lessons, skits, activities, presentations, demonstrations and songs focused on the first four chapters of the public health training program; Communication, Nutrition, Bodily Hygiene and Oral Hygiene. The six module-training program is designed to teach one module every two months over the span of one year. Every 2 months, the 24 CHWs in training return from their villages to the HFH office in Charpentier for an intensive 2-day training module. Each of the participants take a pre and post test and must all pass in order to have successfully completed the module. In the two-month period in between the training modules they must conduct a minimum amount of school-based lessons per month at their school and complete all relevant reporting forms. They are expected to maintain a positive working relationship with the school director in their community in creating a safe, cohesive learning space for the students at their school. Each are equipped with CHW training kits with supplies that they can use to teach their lesson plans. The program’s goal is for each child in the pilot program schools to receive one hour of Public Health instruction per week. This is a minimum standard. If they wish to teach more sessions per week, they are strongly encouraged to do so. Each time they teach a lesson, they record details about the session on the School Lesson Reporting Form, which they and their School Director will sign. They have two months to teach all of the themes in each Module to the school. They are asked to teach at least one activity along with each theme. The lessons take place during school hours, during the school week. There is no need to teach lessons on the weekend or when school is not in session. For now, the program will only teach children attending the Hope for Haiti supported partner school in each target community. No formal health lessons are approved to be given to anyone other than the children attending this partner school. However, they are encouraged to share information with their friends, families and neighbors, as this is an important part of making community health promotion successful. The starting stipend for the CHWs is $25/month but this may go up as we continue to define the responsibilities and duties of the CHWs. I've been invited to give the opening keynote address at the annual NEAHP Conference in Newport, VT on March 13th. I haven't quite decided what I'd like the talk to hit on yet but I'm beginning to brainstorm some ideas. It's so great to see that an organization like this exists! Below is a little more about the NEAHP and the website where you can learn more! The New England Association for Healthcare Philanthropy (NEAHP) is a not-for-profit membership association for healthcare development professionals, founded in 1960. Last night was my presentation at Roger Williams. It was my first time ever visiting and put simply, I couldn't have been more impressed with the coordination and maturity of the students who both organized the event and those who attended. A few days after I accepted one of the Do Something Awards on VH1, I was emailed by a young lady from RWU who was interested in helping my cause in any way she could. I told her about my upcoming speaking tour and how I would happily make room for a visit to RWU. Over the next few months, this woman, Polina (a junior at RWU) organized everything from the pre-event dinner with select students to the actual presentation itself. 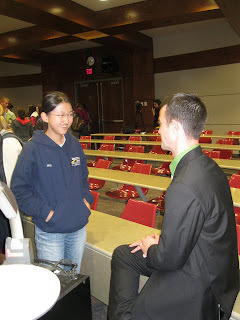 Since she did this on her own and not as a part of a student group, she had more obstacles than usual to overcome in order to have her university approve and pay to bring me in as a presenter. These are the three things that any presenter hopes for! 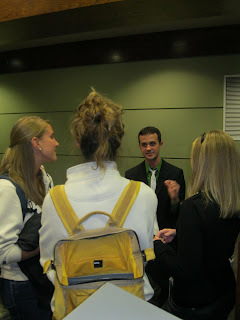 Talking with three highly motivated seniors on their way to medical school. Last night was incredible. I received an invitation last week from the office of the president of Brown University inviting me to dinner with Dr. Paul Farmer and Edwidge Danticat. I nearly jumped out of my seat. Though I’ve been sick for the last several days, I pulled myself out of bed and popped one of the IBUprofen that the doctor gave me and made my way to the dinner. I was the first to arrive and got a look at the guest list. I was shocked to see that of all the guests, only a few handful of people had been assigned a particular table to sit at and I was one of them. I nearly lost my balance when I saw who else would be sitting at my table. I was first of all, seated right next to the man who inspired me from the very beginning when I decided to dedicate my life to working in Haiti, Dr. Paul Farmer. Also sitting at my table was the president of Brown University, Ruth Simmons and the one and only music superstar Wyclef Jean. Also in attendance at the dinner was a great mentor of mine, Patricia Symonds and several prominent figures at Brown like Patrick Sylvain (Haitian studies professor), Dr.Susan Cu-Uvin (Director of the Global Health Initiative), Dr. Tim Empkie (Director of the Global Heatlh Concentration Program) and Africana studies professor Tony Bogues. It was an unforgettable night. When Dr. Farmer first walked in, he was arm in arm with my mentor Pat Symonds. When I went to go reintroduce myself, he had already known who I was (Prof. Symonds reminded him on his way over, I’m sure). He congratulated me on the Do Something Award and continued to tell me how proud he was of the work that I’m doing in Haiti. We could hardly believe that it was six years ago when we first met. I was a freshman in college waiting in line to get my book signed by him and to tell him how badly I wanted to spend the rest of my life working in Haiti. He wrote in my book, “I hope you never lose your drive to better the world.” Six years later, a medical student, I would never have thought I’d be sitting next to him having dinner telling him about the public health work I’ve been up to over the last three years. He interrupted me twice, put down his fork, folded up his napkin and shook my hand, congratulating me on what I’ve accomplished thus far. When I told him about raising $250,000 during my year in Haiti and getting jetBlue to sponsor my flights to the Dominican Republic, he was shocked and told me that he couldn’t have done at my age what I’ve been able to do. While he was being very modest, I was touched by that and my heart was immediately filled with a renewed drive to continue in my passion for Haiti. We talked about my public health training program and the struggle of balancing med school curriculum and my trips back to Haiti every few months. He paused to think of what advice he could give me and told me to weigh my priorities. He told me to go the Dean of Medicine and tell him what I’m doing and why it’s important. “Tell Ed I sent you,” he told me. “Just be careful not to ask for more than what they can give you,” he warned me. We talked about how med school is pretty much the same routine for everyone and that it’s important to get through it., even when it doesn’t always seem relevant to what I’m doing or what I want to do with my medical degree. He told me not to worry about honors, but to do well on the boards and if I need to pack up and leave for Haiti (fake an illness) and miss a few classes, that I be sure to make some flash cards and study at every opportunity I get. “When your bus breaks down in Haiti, pull out your flashcards and study, study, study,” he told me. Last night was my first time meeting Wyclef and Edwidge Danticat. Edwidge is a beautiful, powerfully spoken woman who commands an audience with every word that leaves her mouth. Her books are inspirational, mind-boggling and heart-breaking. It was an honor to be in the presence of such an incredible writer and woman. Wyclef on the other hand, had a very different aura to him. He walked in and introduced himself to me as “Hello, I am Wyclef.” I wanted to say “Of course you are!” but instead, I said, “Hi, I’m Will.” Throughout the night, Dr. Farmer who was sitting next to me and Ruth Simmons who was across from me kept leaning over to me to tell me how great of a mind Wyclef had. President Simmons even stood to give a speech on how brilliant of a man Wyclef was. Before last night, I was only a fan of the music artist Wyclef and definitely not a fan of his involvement in Haitian politics, but now, I am even more a fan of the music artist Wyclef and even less a fan of his political involvement in Haiti. While Dr. Farmer kept reassuring me that Wyclef was a musical genius, he never once commented on Wyclef’s ability to succeed in politics. After the dinner, I spoke to a friend of mine about how confused I had been about what to believe concerning Wyclef. Two people who I admire greatly, Ruth Simmons and Paul Farmer, had repeatedly told me how brilliant of a man he was that I had began to believe it myself. Not to say that he isn’t an incredible artist, I was taken aback by the fact that two power house figures would be such great supporters of a man who has repeatedly embarrassed himself and his country in the eyes of the media over the last few months. Then it hit me. While Paul Farmer is an incredible doctor and Ruth Simmons is the best president Brown has ever had, they are both unbelievably successful at what they do because they are indeed incredibly talented politicians. While Wyclef may not be much of a politician, he is a Haitian, grammy award winning music artist who has an enormous fan base. That alone is all it takes to make friends in high places. When I first began learning about Haiti back in high school, I was given the book Mountains Beyond Mountains by 6 people. After reading the book, my first thought was " I want to meet this man!" When I was on my way out of my high school library, the librarian saw the book under my arm and asked me how I liked it. When I told her that I loved it and would love to meet either the author or Dr. Farmer himself, she told me that Tracy Kidder was her neighbor. She gave me Tracy Kidder's email address and in a heartbeat I was sitting at a computer typing him up a long email telling him about my life and how I made it to an elite boarding school on a full scholarship having come from a lifetime of poverty. He wrote me back with his telephone number and asked for me to call him. That night, I sat in my dorm room chatting with Tracy Kidder himself for nearly an hour about what it was like to follow Dr. Farmer in Haiti and how he ever put into words what he experienced. I'll never forget what he told me that night when I mentioned how much I would love to go to Haiti and work someday. He said, "We're talking about life and death here. Working in a poor country like Haiti is not as romantic as it sounds." That line has resonated with me for the last six years. After that conversation, he put me in touch with Dr. Farmer's office and over the next several years I met Dr. Farmer on several occasions and was ultimately convinced by him to defer medical school for a year and follow my passion for public health in Haiti. Next week, President Ruth Simmons has invited me to join her and Dr. Farmer for dinner. I haven't seen him in over two years so I'm very excited. Following Tracy Kidder's invite to Roger Williams University yesterday, I've been invited to give a presentation on my work in Haiti and to discuss the book Mountains Beyond Mountains written by Tracy Kidder and how the book inspired me to work in Haiti. The talk will be on October 6th at 7pm at MNS 200. A dinner with faculty and students will precede the presentation. March 24th-25th, 2011, I've been invited to Wilmington College in Ohio to be a speaker as a part of the Issues & Artists Series. A dinner with students and faculty will precede the event. The formal program begins at 7:30 p.m. (45 minute presentation followed by 15-30 minutes of Q&A), followed by a reception. The Issues & Artists series at Wilmington College provides an opportunity for cultural and intellectual enrichment for students, faculty, and the community-at-large. 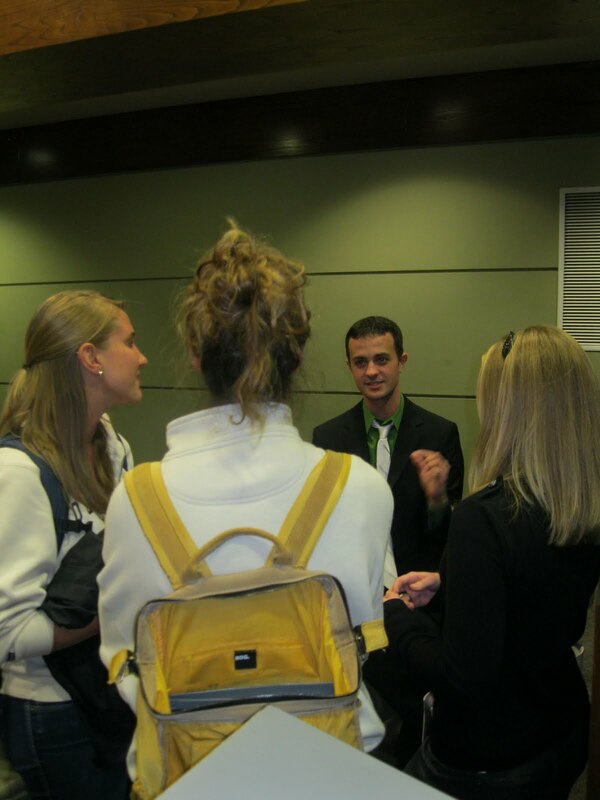 Wilmington College is a Quaker-affiliated liberal arts college whose mission requires the integration of character-building into the curriculum and mandates that students be educated on global issues. This series of lectures, performances, and presentations helps fulfill this mission by broadening cultural horizons and educating the audience on compelling social issues. The series also seeks to foster a respect for and an awareness of each individual’s place in the global community. The audience for these events is made up of students (75%), faculty and staff (15%), and members of the wider community (10%). The size of the audience for previous events has ranged from 175 to 450 people, depending on the appeal of the program, the connection to courses offered at the time, and factors outside of our control – weather, other events in the College and surrounding community, etc. jetBlue has generously sponsored my next 5 flights to get me to Haiti. Since they do not fly directly to Haiti, they will fly me to Santo Domingo in the Dominican Republic. I am still fundraising for the short round trip flight from Santo Domingo to Port au Prince (~$250). Please consider donating. Every little bit counts! I am currently working with American Airlines to have them become my long-term sponsor but jetBlue stepped forward and offered to support me until I find another airline that flies directly to Haiti. I am a second year medical student at Brown University with a degree in public health. I have been working in rural Haiti since 2008 developing public health education and training programs, bringing health care to areas of Haiti where there are no doctors. When I graduated from college, I deferred medical school and lived in Haiti for a year. This blog tells my story of how I created a public health program that changed the health status of a 600-child orphanage in southern Haiti. My passion is for what I call "political medicine." I am striving to change the face of medicine, how it is practiced, to whom it is distributed, and how it is defined through policy change on an international level, securing health care as a human right. I believe in a universal standard of health care for all people. 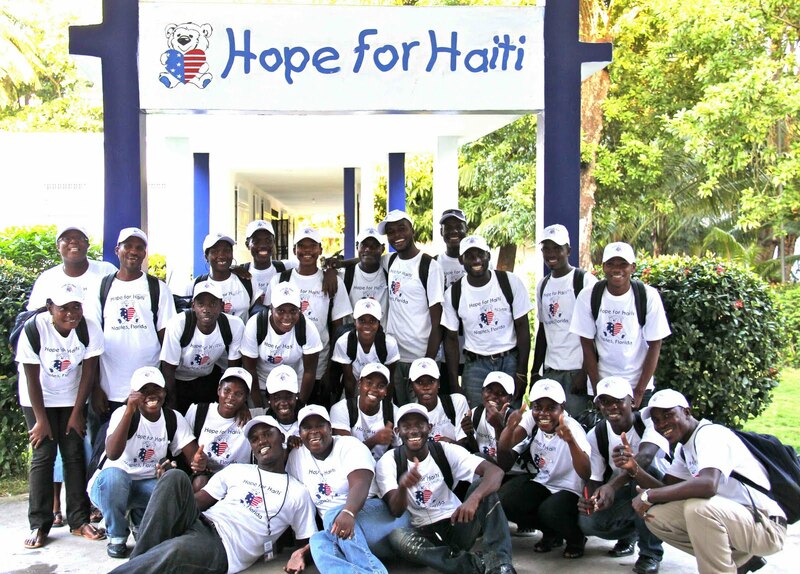 Please donate to Will in Haiti through Hope For Haiti. Click on the link below to be routed to their donation site. Please indicate Will’s Public Health Program in the Special Instructions to the Seller section if you are donating through Hope for Haiti’s paypal site. In the memo line, please write ‘Will’s Public Health Program.’ If you would like to donate towards my travel expenses, please write ‘Will's Transportation’ in the memo line. 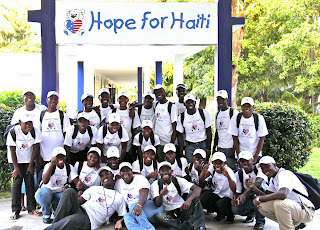 Hopeforhaiti.com is the official website of Hope For Haiti, which is a 501(c)3 registered non-profit. Donations are tax-deductible. Thank you for your support!!! None of what we do is possible without you!